The first week of the NCAA football season saw the top dogs flexing their muscles with a little bit of movement in the Associated Press Top 25 poll. Two teams were dropped from the rankings and two new sides took their place, and a few borderline contenders saw their stock fall dramatically after disappointing starts. But how has the AP Top 25’s shakeup been reflected by some of our favorite sportsbooks? Our weekly AP v. Oddsmakers table is here to help provide some insight into the world of college football betting. Which teams might have a better chance at winning it all than the press might believe? Which teams are overrated? Find out where they stand below after a thrilling opening weekend. Florida State came into the 2018 season ranked 19th with expectations to make some noise in the ACC. The Noles fell flat on their face in a Monday Night home opening 24-3 loss to Virginia Tech as the Hokies came out of the matchup looking like a team ready to challenge Clemson’s conference dominance. Adding insult to injury for Willie Taggart’s squad was the vaulting of their instate rivals, the Gators, into the poll after a 56-3 romp over Charleston Southern. Another SEC team, the South Carolina Gamecocks, replaced the Texas Longhorns in the rankings thanks to a 49-15 walloping of Coastal Carolina. It may be a bit of a stretch to label Lincoln Riley’s Oklahoma Sooners as “underrated” but they completely obliterated the spread in their 63-14 beatdown of Lane Kiffin’s Florida Atlantic. 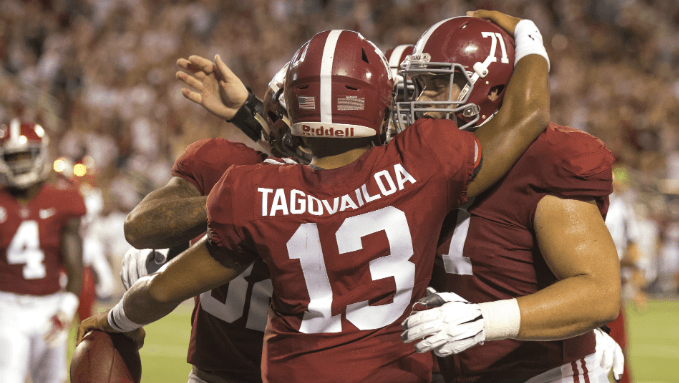 The Sooners’ defense crushed one of last season’s best offensive teams, and that could be the big difference for them in the race for the playoff so they’re a strong pick with several sportsbooks at +2200 to win a championship. Another team that established itself as an outside title contender was Chip Kelly’s Notre Dame. Thanks to an impressive opening win over Michigan, the Fighting Irish got off to a strong start to what may be their toughest schedule in years. At +3300 to win the title with RedZoneSports.bet, Notre Dame is an interesting longshot should they run the table.